For those of you that may not know, yesterday was a huge party day for buns all over the world. There is a famous bun called Smudge that lives at the Ebony Eyes retirement home, and yesterday was a celebration of his first year there. Everywhere there were buns, there were parties. There was music, dancing, and lots and lots of food. We, once our 2foot had finished cleaning our bedroom, we had a party and fresh vegetables, yummy-yummy. We are now having a lazy day, although Tigger has suddenly had a spurt of energy and wants to play. Mister Jingles is having none of it. Bye for now - Loppy, Mister Jingles and Tigger. Right, before Loppy presses the send button; Jingles here me old mate, just asking how your dazzling girlbunn Flopsy Girl is. You lucky bunn you. Well Mr. Jingles, what can I say? Flopsy Girl is obviously the prettiest doe in the world, and she is hopelessly devoted to me! 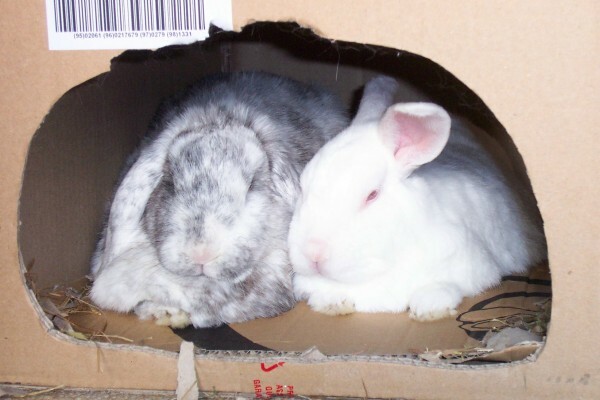 Hello Dandy and Flopsy girl... Bammy and Grace here .. we too are all partied out in Smudge's honour.. we had plenty of greens, carrot tops, fresh hay and anything else we could get our teeth into.. Grace likes the carpet.. same colour as the veggies.. I'm partial to the sofa myself.. anyway we got a little bit carried away with the dancing and trashed the litter tray.. oopppppppssssss!!! !